The Union Public Service Commission (UPSC) is going to held Combined Defence Services Examination (1) 2016 on 14.02.2016 at various exam centres.This exam including SSC women (Non-Technical) course.It is notable that this course is important to admission to Indian Military Academy,Indian Naval Academy and Air Force for the courses commencing in January 2017 and Officers Training ,Chennai,for the courses (Men and Women) commencing in April 2017.UPSC has been issued a separate notification about this course.Only online application will be accepted.No other mode of submission of application is allowed.The detail of eligibility,conditions,syllabus and scheme of the examination,guidelines published in the Employment News 07.11.2015 to 13.11.2015 or website www.upsconline.gov.in. Last date for online application-04.12.2013. 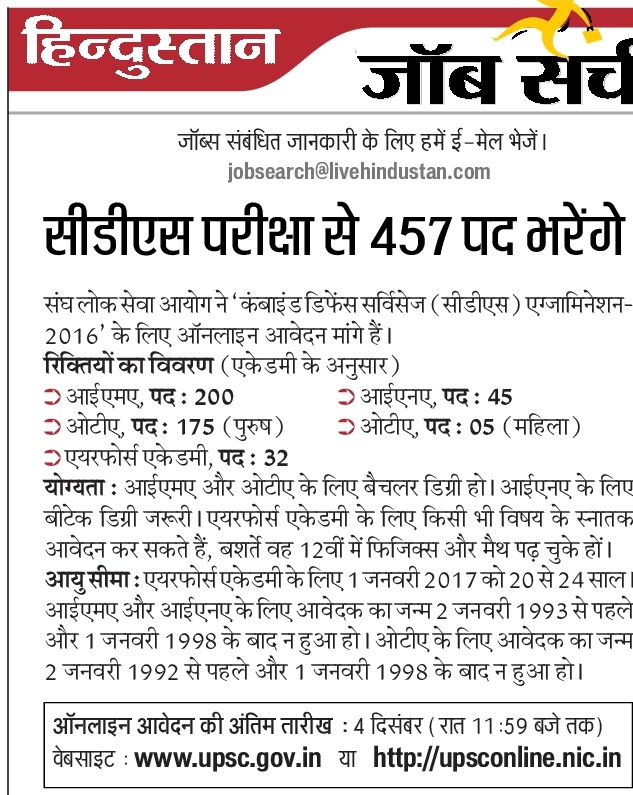 Last date of online application-04.12.2015. Date of written test-14.02.2015. Officers Training Academy (Non-Technical)-12 Posts. Penalty for Wrong Answers-There will be penalty for wrong answers marked by a candidate. Mobile phone banned-Mobile phones,pagers and other electronic device are not allowed in the examination hall. Major-6600/-,Stipend during training at services academics-Fixed stipend Rs.21000/-.per month. Annual Leave-60 days in a year. Casual leave-20 days in a year.